JBoss EAP 7 was recently released, and brings with it a whole host of new features and support, such as support for Java EE 7, Undertow (a highly scalable web server), reduced port usage, graceful shutdown, improved GUI and CLI management, and much more. Go ahead and download it, unzip, and run bin/standalone.sh and check out all these great features. What’s that? It didn’t work? Did you check that your JRE is compatible? Are there outstanding incompatibility or security issues that may be resolved in an available patch? Perhaps you’ve already installed it elsewhere on your system and you are trying to install a conflicting version. You’re not running it as root are you? ZIP files are awesome for getting bits up and running quickly (as a developer I use them myself quite a bit), but its simplicity hides many issues related to production software management, such as those I just mentioned. It’s perfect for cross-platform developers or those non-RHEL CI/CD setups but for production RHEL systems it’s the tl;dr of enterprise software deployment. This is where Red Hat and RPM can help. You can be sure of what you’re installing, that it’ll work securely, that you’ll know it’s there when asked, and that it’ll be manageable using your other investments (think RHEV+RHEL+Satellite+JBoss). If you have multiple subscription pools that match your product(s) you may need to specify a specific pool with --pool. More details about Subscription Manager can be found in its official docs. It’ll take a few minutes to download all of the bits, but once it completes successfully, you will have EAP 7 installed in /opt/rh/eap7/root/usr/share/wildfly. And you can run bin/standalone.sh to start it up. 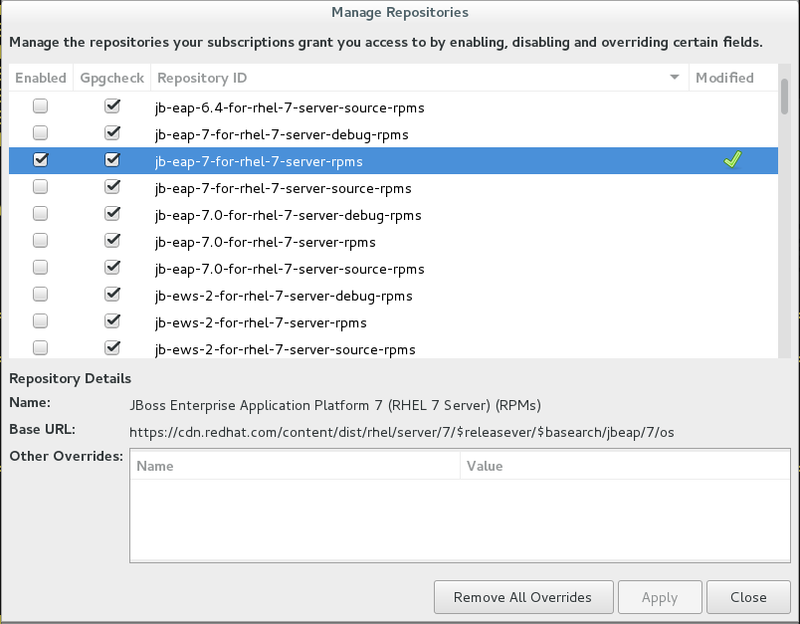 An RPM installation of JBoss EAP 7 installs everything that is required to run JBoss EAP as a service. Use the following command to activate the JBoss EAP service to start automatically at system boot. More information about the various installation options for EAP 7 can be found in its official documentation.